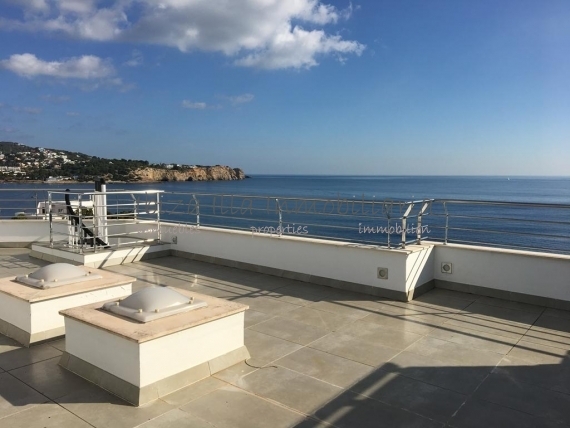 Luminous semi-detached house on 2 floors plus underground garage in one of the most sought after areas of the island with spectacular views of the sea. Located a short walk from Ibiza town and Talamanca beach, the Marina Botafoch nautical harbor is just around the corner and all this without giving up the tranquility of living literally in front of the sea. East facing enjoys of incredible sunrises and the first rays of sunlight of the day. On the ground floor we find a spacious living room with modern open plan kitchen, laundry with access to the backyard and a toilet. On the first floor the 3 bedrooms, 2 doubles and 1 single and 2 full bathrooms. From the suite is accessed by stairs to the upper terrace with multiple possibilities and really impressive views. It is part of a small building with only 4 neighbors. There are no monthly expenses.